Need a short adaptor instead of a long one? They're available here as an optional accessory. Each valve is supplied with: Complete Plastic Valve Body, Brass Arm & Adaptors. Cord & Nuts supplied with Long Brass Arm Valve only. Ability to attach a diffuser hose to reduce water turbulence & noise in top entry installations & Anti-Syphon Holes to prevent back flow. The Hansen Fastflo Valves is protected by intellectual property rights owned by the Hansen group of companies in NZ and Australia including NZ patent application 626771; NZ design application registered design 418914. © 2014 Hansen Developments Ltd. Patent and design applications pending in other countries. 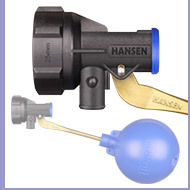 Hansen Valves feature a patented Hansen Ezi Bend brass arm making level adjustment a breeze.